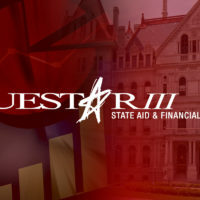 Questar III’s Financial Service offerings support the many district operations relating to accounting, auditing and state aid. The Centralized Business Office offers a combination of accounts payable, payroll and general accounting based on district need. The Fixed Asset Inventory & Appraisal Service provides districts with a detailed and complete inventory system. Our GASB 75 team works with districts to ensure proper management of other post-retirement benefits. We have developed risk assessment and internal auditing services designed to meet the requirements of the 2005 Fiscal Accountability Legislation. Our State Aid and Financial Planning Service is the largest BOCES service in the state. It has served districts and BOCES across New York State for the last 45 years assisting them in maximizing their available state aid and providing training to district staff through webinars, email updates, biannual workshops and individual consultation.